www.thespacegame.com • View topic - Edge or Anomaly found in space. Edge or Anomaly found in space. Trying to get to 299,792,458 sector because it is the same as the speed of light expressed in m/s. So i started out choosing crappy looking dead planets (red small dull ones) going out more in a positive y direction but still traveling on a angle more up then out. All is going good then space thins out and i cant really go any more no more stars. I got part way towards my goal 137,200,140 and hit a wall (void area of stars) i thought it was the + X direction i lost travel in at first. Turns out with a bit of exploration and map traveling i came to the conclusion that i can not travel any further along positive Z then sector 138-141 kinda bumps along (not flat). You will find what i'm talking about at Vivic-uc2-1280. Does anyone have any bookmarks with a positive z value greater then 141? - If so this is just a anomaly of missing systems/stars.Ram will like that less sectors to map. How far would i need to travel in any direction along this to classify it as a edge? Could you fly out and look? All values talked about are + only not negative. The area is sparce so it will take me some time to explore in any direction to find out what this is. Had to share this , thanks for your time and future input! Last edited by Vivic on Fri Aug 18, 2017 1:51 am, edited 4 times in total. Re: Edge or Anomaly found in space. Between purple and myself we covered 100 sectors of distance along this edge or wall or whatever from point of incidence. He traveled 50 sectors tonight along the wall in the +X direction. I traveled 50 sectors along the lets call it a wall, 50 sectors in the - X direction. The wall itself deviates with available stars a sector sometimes 2 in the + and - z direction it is not flat. In fact the 100 sector distance revealed to us that the wall on purples end, +X direction is increasing in distance along the +Z direction away from Apollo. While mine is decreasing along the +Z axis making me closer to Apollo . The number is going off what he said in chat but it appears to be a 8-10 sector angle on the wall away from Apollo on the +X side over a 100 sector distance. What do we know for sure, the wall is not straight but angled away from Apollo on the X axis slightly. We have only documented direction travel away from point of incidence along the X axis . Nothing has been done with y axis. Hi Viv. Just been out to Vivic-uc2-1280 & I still see many systems. Not too sure it's an edge. But we don't even know if the inners are central so who knows. I've been out around the 13k LY mark & it's hugely dense. Boz may be able to add more info. I traveled along the positive X axis with the z axis increasing at times to +148, until I got to gotpurplefleas-257, which is located at 275x, 206y, 142z, which shows that the Expanse (lol) was once again encroaching into Z space. I am fully expecting that this is an arm that will turn outwards again, tho as it has been stated, we don't know exactly where we are in the galaxy, so I can't say that with certainty. The Y axis needs to be explored further too, because at one point I came across a section that appeared to be only 12 sectors thick...top to bottom. This may have only been a point that stuck out into the expanse, or it could have been the edge of space...idk. Need to add some notes for more info , at vivic-hbc-1306 star sector 98, 205, 141. Another shift like the last one with the losing the x and gaing z vivic-kk0-1311 as this marker. another shift out 4 sectors just like the last . Lost part of the distance gained outward from Apollo 4 sectors back towards Apollo vivic-q8d-1319. Still trying to push by +z and or contour whatever this is. It is a bubble lost all my ground in pos. z back to 138 on poz z from 144. The demensions of the bubble is 22 sectors across 6 sectors high away from apoloo. Ending at vivic-4h0-1323. lets get back out there enough notes. Starting to get pushed in at sector at 11,209, 138 vivic-xts-1342,nearing 0 on the x axis. Arrived at the 0 sector of the x axis , i get the feeling i'm kinda halfway up the arm towards the ceiling. I can confirm or deny this theory by switching to a positive or negative y direction. If i'm on the "ceiling" like predicted if i go down the neg y the path will open up confirming the ceiling theory. then i can continue or contour the ceiling by going in the +y direction. Now is a better time then any to head down the neg y axis see what i'n dealing with . The sector address is 0, 207,136 system here is vivic-3on-1347. I will be continuing down the y axis from this spot keeping to the wall . I believe given a large enough time on this wall with say 250 by 250 sectors 5 sectors deep i might be able to make a 3d model of the outside rough edge, like that of our finger prints. Get a very , very good map of the galaxy that would show these raised finger print like bumps on the exterior of the arms. Grab the model and the map and start searching. Match them up and like magic we know where we are , where the center is and where earth is located all in one big go. Going to highlight this area and ask for feedback. Last edited by Vivic on Sat Aug 19, 2017 3:22 am, edited 11 times in total. Vivic wrote: Need to add some notes for more info , at vivic-hbc-1306 star sector 98, 205, 141. The wall has moved or i'm turning a corner , i now have some access to the +z direction but have lost stars in the + X direction at the above location. added this info in case this might be a corner. How long does this corner or change in direction go? Oh you got the ascent exploring bug bad my man! Great to see, please keep us updated. I was wondering, though, if there actually IS an edge to the universe here? Could it be that, just like when we enter a new asteroid field and that triggers new asteroids to begin to spawn, that every time we get out to to where no other systems have been discovered yet, new systems are triggered to spawn? 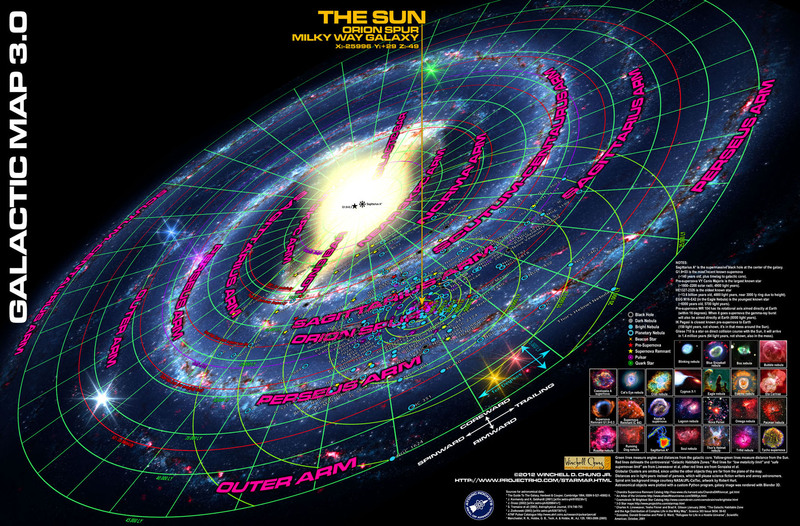 The game is mapped after out own galaxy the milky way a spiral galaxy, is it "The edge" not sure. I can tell you out there what i call a wall is space devoid of stars (for 3 sectors at least) the stars are all fixed in position i have yet to see a star system spawn. I have found a edge and traveled along it.Where this edge might be located within a spiral galaxy who knows jam could have put Apollo anywhere i could have just traveled along a wall, ceiling, or floor of the arm of the galaxy. Anything i would say more than that would be a guess but going to throw out a guess anyways. I hit the upper part of a wall or transition to the ceiling of a arm of the spiral . further evidence can prove me right or wrong shortly (i think), Hope that answers your question should you want to visit it is only 70k hydrogen from Apollo. The original post has the system of of where i first encountered this emptiness when i ran into it. Couldn't help myself, if i could get your feedback on the pink text above it would be great ! Last edited by Vivic on Sat Aug 19, 2017 5:26 pm, edited 1 time in total.